One of the largest families of freshwater tropical fish suited for the home aquarium is the Cichlids. One of the distinguishing characteristics of this diverse species can be, that the rays in the front of the dorsal fin are spiny, like those of a Sunfish or Bluegill, this is not an absolute but true in almost all Cichlid spices. A large and varied assortment of Cichlids are found in fresh water throughout the Southern half of North America, Central and South America, and Africa, and a few are known from Asia Minor and India. Many are known as savage little creatures, fond of destroying the vegetation in carefully planted aquariums, and of quarreling with other fish. How they are misunderstood! Cichlids dig up the plants in an effort to build a nesting area and attract a female. They quarrel with other fish in the aquarium in a show of territorial defense, again to attract a female. These amazing fish, in many cases, attract a female and mate for life! Some of the Cichlid family will violently guard their nest and territory even before they are mated, then care for their eggs together, hatch their fry and raise them until they can fend for themselves. A few Cichlid species are of a peaceful nature; such as the Rams and Kribensis, others are so interesting in their habits, or so attractive in color, that they are kept in spite of their bad disposition. There is no finer breeding project in the tropical fish hobby than the projects dealing with Cichlid pairs. Here in About.com we have discussed many; The Discus, The Angel Fish, The Kribensis, The Egyptian Mouthbreeder and many others. One of the best-known and most loved of the Cichlids that can co-exist within a community aquarium is Pterophyllum scalare, the “Angel Fish” or as it is sometimes referred to as “the half moon fish” of the Amazon. The name Scalare is commonly used not only for this species, but for Pterophyllum eimekei, a smaller species that closely resembles it. They look outstanding in groups of six or more, swimming about the rock ledges of a well planted large show tank or even a single of these remarkable fish add a splendor that no other fish can approach. To say that a fish is “silvery” is not very descriptive but the “common” angel or Scalare gleams with a pure and burnished silver set off by the narrow horizontal bars of black that extend across the body and into the silvery fins. The dorsal and ventral fins are greatly developed, as are the long, thread-like rays of the ventral fins. The fish itself is disc-like, and so flat as to be almost invisible when seen head-on. The Angel “Scalare” is peaceable in nature, living well with other fish; it will eat dried food, but prefers small crustaceans and worms, and must have these at least at intervals to remain in good condition. 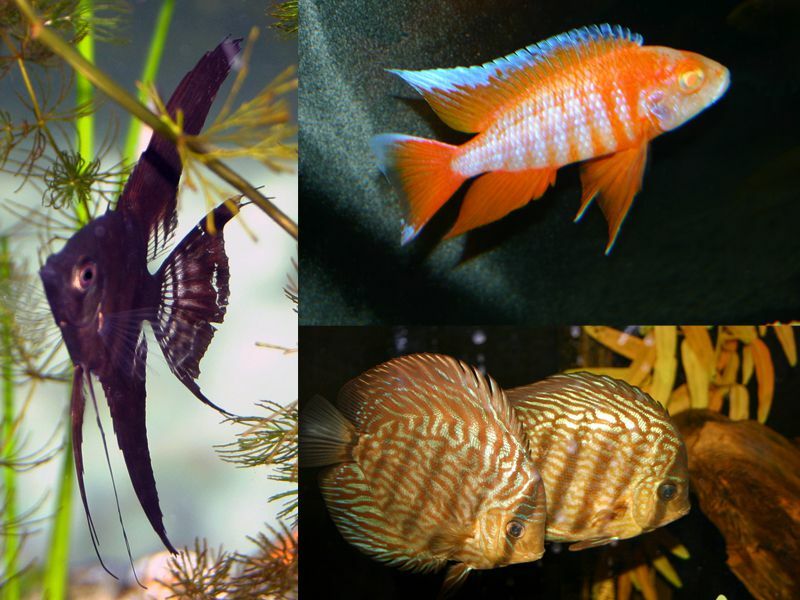 The Angel Fish is easy to breed in an aquarium and has been bred for many decades, giving the hobby many variations from the common variety described to long fined veil tail to a variety called “Koi” which is black silver yellow and orange! The eggs are laid on leaves of the Amazon sword or flat long pieces of slate. They may be removed and hatched in a separate tank, or with a good pair hatched and raised by the parents, a real sight to behold! Other peaceful Cichlids are the Symphysodon or Discus Fish, first referred to as the “Blue Scalare”, later the “pompadour fish” and now generally referred to as Discus. At one time this fish sold for hundreds of dollars and had to be collected by hand in the Amazon. Today, breeders produce all we need within the United States, and provide the uniquely round fish in dozens of colors. Haplochromis Multicolor, the Egyptian Mouthbreeder, is one of the most fascinating fish of all for the beginner to the aquarium hobby to watch. The Egyptian Mouthbreeder is a brightly colored little fish, the male showing metallic blue, gold and green in its scales and similar gay colors in its fins. But its method of caring for the eggs and for the young is what has won it its popularity among tropical fish hobbyists. The Egyptian Mouthbreeder does not need a large tank, or artificial aeration of the water, or even very high temperatures to induce spawning. The eggs are laid in a depression in the sand, and after being fertilized they are taken by the female into her mouth where they are held during the period of incubation, which is usually about two weeks. Even after the eggs hatch the young remain in her mouth for a few days longer. There are many other mouthbreeders, most belonging to the African Cichlids variety, which are so brilliantly colored; you may think they are salt water fish. They are not; they are from the great Rift Lakes of Africa. These “African Cichlids” are among the nastiest of all Cichlids and cannot be put with any other fish, not even other Cichlids. They will spare no time killing everything except other Africans, Cichlids, and even then you must be careful to combine only compatible species of African Cichlids. Once established, an African Cichlid tank is among the easiest and most maintenance free environments you can keep. The old standard Cichlids from Central and South America, again cannot be kept with other fish, but can be kept successfully with each other. Most of these Cichlids grow quite large, up to 18 inches, many a bit smaller, but will still kill anything they can overpower and eat! They do fine together, if you start out with all young fish and grow them up together in a large aquarium. SPECIAL NOTE: Remember, Cichlids are pretty much the top of the food chain in lakes, ponds and streams. In nature, our community aquarium fish like guppies and zebras are their food, in nature they eat the bugs and larva of the bugs, and the cichlids eat them! Cichlids are not cruel, they are not “nasty fish”, this is all part of nature, part of being in the freshwater tropical fish hobby is learning about nature, and this is nature, pure and simple! Even the big boys of the aquarium world will kill each other, or badly injure their tank mates during the spawning period. Nature demands that they reproduce themselves, unlike the minnows, our common tetras, barbs and Danios which breed every 20 days or less and have hundreds or thousands of eggs, these large predators mate for life, spawn in the spring usually once, and raise their fry for a long time as a family. They will kill anything to protect their young. Think that is harsh? Who do you know that would kill to protect their young, Cichlids are closer to you that you think! These include the Oscar, Jack Dempsy, Jewel Fish, Convict Cichlid, Green Terror, Red Devil, The Parrot Fish, The Sevrum and many others. These fish begin working endlessly, cleaning an area, usually a terracotta pot or smooth rock maybe even an area of the tank side. Soon afterward, they lay and fertilize a group of eggs. In the larger species such as the Oscar and Red Devils, they can run into the thousands of eggs and fry. The parents watch over the eggs, violently chasing off anything that approaches during this period of spawning, even the hand of the aquarist will be bitten if you try to get near the eggs. The parents work hard fanning the eggs to keep fresh oxygenated water passing over the eggs. Once the eggs hatch, the real fun begins, the proud parents parade the fry around the tank, so the young can graze for food, artemia that grows on the rocks and plants. If anything approaches the eggs or threaten the young, they are violently chased off. Most of these species raise the young until they are fairly large enough and ready to fight and fend for themselves.